I don't claim to be a professional quality chef. But for an at-home cook, I'm getting pretty damn good (if I do say so myself). A marker of this "goodness"? The ability to throw together tasty meals without a recipe which is a relatively new feat for me. I'm great with adapting and modifying recipes, but I'm getting a feel for making stuff up on the fly. Simple stuff, but still. 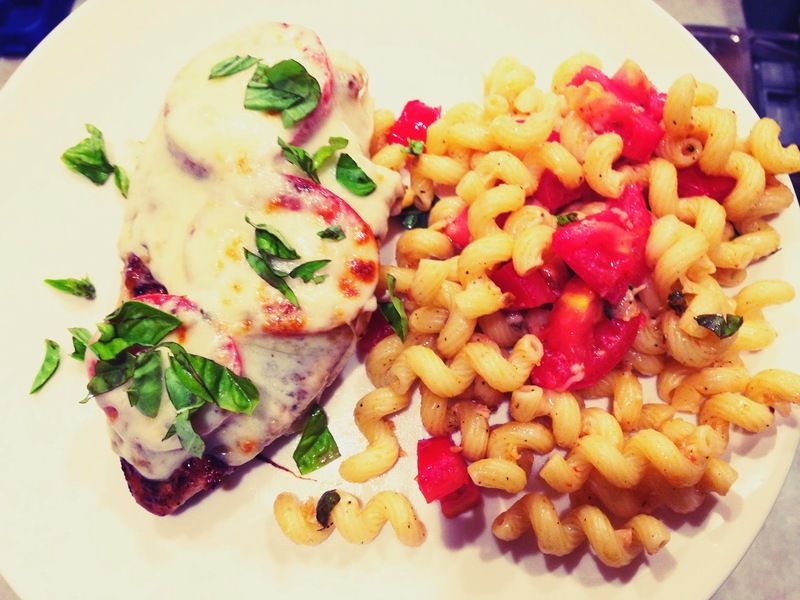 Case in point--Last night's Caprese chicken and pasta. Please make it today! All you do is generously salt and pepper chicken breasts, and grill on the stove or BBQ. When a couple minutes from done, top with sliced tomatoes, shake over some garlic salt and Italian seasoning, drizzle a bit of balsamic, and cover with slices of mozzarella (thick ones, if you're being naughty like me). Broil for a few minutes and top with basil. That's it!